The bank of Tycoon Online owns all assets and resources that are not owned by the players. The bank lends out money to players, takes care of the assets of bankrupt companies and handles wealth tax. Wealth tax is only paid by rich players with money to spare. The info page displays the bank's assets: Money lent out, how much money the bank currently has, how many shares it holds and what these shares are worth. This information is of no real importance to the game play. The bank gains shares when a player sells them to the bank, or when a player goes bankrupt. When players reset their accounts, or go bankrupt, shares that the player owned in other companies are transferred to the bank. These shares are automatically put for sale on the market after a delay of 2-22 hours for shares held by a bankrupt company, or a delay of 30-300 minutes for shares sold directly to the bank. The shares of his or her own company are deleted as they are then worthless. If the bankrupt player had goods in his or her warehouse, the bank will take these as well and automatically put them for sale on the market. Employees that the player had hired also reappear on the list of unemployed people after a delay of 5-10 hours. If you are in need of money, you may sell goods instantly from your warehouse to the bank. The bank pays you for your goods at once, which is good if you need quick money. Also, there is no limit to how much goods the bank will accept. If your goods are plentiful on the market, however, the bank will refuse to pay you fully for it. For every 5,000 units of those particular goods that are currently on the market, the bank will pay you 1 to 3 iKr less than market price. The decrease in price depends on what stage of the refining process your goods are. If it is a raw material (like oil, wheat and wood), the decrease is 1 iKr. If it is a stage two material (like alcohol, gasoline and planks), the decrease is 2 iKr. If it is a stage three material (like bread, furniture and toys), the decrease is 3 iKr per 5,000 units currently on the market. The max discounts the bank may give itself is 5 for raw materials, 10 for stage two materials, and 15 for stage three materials. Goods bought by the bank are later put for sale on the market. Hint: A young company requires a quick cash flow. In the beginning, it is better to sell your goods to the bank than on the market as this obtains you the money you need to expand your company as rapidly as possible. Later on, company value will be more important than quick money, and this is better obtained by taking advantage of market bonuses when selling goods on the market. It is possible to invest money once your company value reaches 20 000 iKr. When you need to raise your company value, investing is the most efficient option. When you do this, the bank helps you properly invest your fortune, gaining you 1 iKr of company value per 20 iKr invested. Investing is simple. Choose the amount you would like to invest and the bank does the rest. Note that investing money does not decrease your company value like most other ways of spending money does. Hint: It is advised to invest only when you have money and nothing to do with them. This is usually after you have reached the maximum number of buildings you can build. Investing increases your company’s net worth more than purchasing zones or increasing warehouse capacity does because you do not lose company value when spending your money on investments. Like in real life, you may borrow money from the bank. The maximum amount that you may borrow equals your company value. 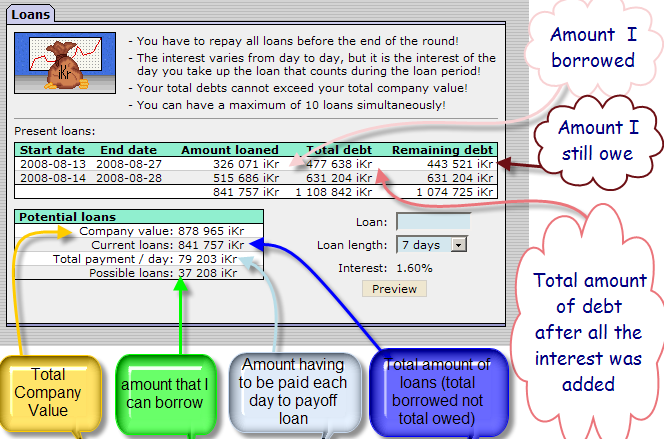 For instance, if your company value is 10,000 iKr, the bank will allow you to borrow a total amount of 10,000 iKr. This can be divided on several loans. There is a limit of 10 active loans at any given time. When you borrow money from the bank, the bank creates a payment plan for you. This will depend on the bank interest when the loan is taken, and on the duration of the loan. The interest is fixed, meaning that when you take up a loan, you will have to pay the interest given the day the loan was taken. The loan will not be affected if the interest changes the next day. Interest on day 0 is always 2.50%. After that, it is randomly chosen each day, and the range is 1.50% to 4.50%. Down payments on your loans are automatically made every night at midnight game time. If you have chosen a short term loan, your down payments will be bigger than if you choose a long term loan. However, taking a short term loan will save you money because you will be paying interest for a fewer amount of days. If you do not have enough money to make your loan payment at midnight, the money will still be deducted and you will have negative savings. You have until 01:30 gametime to raise your savings to above 0 to prevent the negative amount from being deducted from your company value, and to prevent staff dissatisfaction penalties being applied. See negative savings for more info. It is possible to make manual down payments on your loans. This costs 100 iKr in administrative costs, and you will still have to pay the entire amount you owe to the bank, including the normal payment at midnight. Finally, all loans must be paid back within the end of the round. To enforce this, you may not take up a loan that has a down payment time of more days then what remains of the round. For instance, if 8 days are left of the round, you can take up a loan paid back in 7 days, but not one paid back in 14 days. When less then 7 days remain, no loans may be taken. Hint: When new to the game, long term loans are the best as these have smaller down payments. A short term loan can be fatal if you do not make enough money to pay back what you are supposed to every night. If you are unable to pay the bank, it will deduct the money owed right from your company value. This can severely damage your company, and will ultimately cause you to go bankrupt if your company value reaches 0. Hint: Paying off your loans ahead of time does not do much good. If you pay off your loans early, you will have to repay the bank exactly the same that you would have if you let the loan expire on its own. In addition, you will have to pay the administrative costs of 100 iKr every time you repay part of the loan - meaning you actually pay a little more if you pay off loans before they expire. On the other hand, if you have taken up 10 loans, paying off one will allow you to take up a new loan for more money. This page was last modified on 25 October 2014, at 22:41. This page has been accessed 49,528 times.